Professional Medical Diagnostic Laboratories - MedPro Connect has partnered with the leading "FDA-Approved" medical diagnostic laboratory networks in the nation in order to provide you with the highest quality and local medical testing services available. These are the same medical laboratories that doctors and hospitals use to complete their testing and diagnostic work. 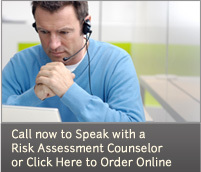 Professional Risk Assessment Counselors - Each of our Risk Assessment Counselors are highly experienced and trained to help you understand and determine which testing services are right for you. They are prepared to answer your specific questions, and to make sure the medical testing solutions you choose will meet your personal and family needs. Professional Results Counselors - Once we receive your results, our Results Counselors are trained and committed to help you obtain and read your test results. In some cases, our clients need help with "interpreting" their test results - this should only be done by your personal doctor or another medical professional. If necessary, our Results Counselors will help you gain access to a doctor through our physicians network. Our professional resources are ready to help you - please call (877) 205-7836 today.